Mother Nature has really been spoiling us on the South Shore recently and this weekend was no exception. With the beautiful weather here could anyone think of anything better to do than participate in the Rockland Town Clean Up? The Rockland Boys Lacrosse team certainly didn’t think so, because early Saturday morning they participated in this town event. Almost two dozen RHS lacrosse players grabbed their trash bags and went up and down the streets of Rockland finding any and all the wrappers, bottles, cans, etc. they could to better maintain the beauty of our town. This is the team’s way of giving back to the town that has been supporting and cheering them on for so long. The whole event was a massive success that really made a difference around the streets of Rockland. 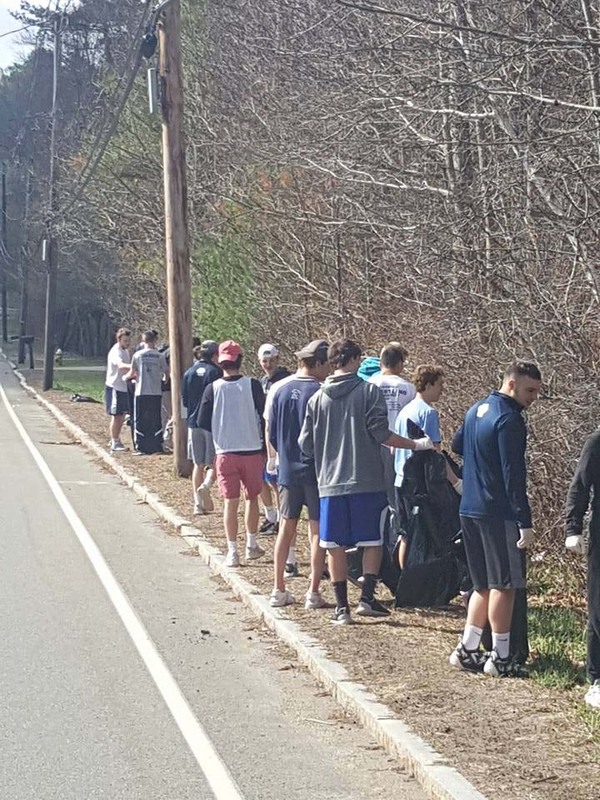 The lacrosse team joined together with close to 100 volunteers to clean up the Rockland Rail Trail, Union Street, the Town Forest, Market Street, Center Avenue and other areas in town. The event yielded approximately 200 bags of trash and recycling, two truckloads of large items, and eight Christmas trees. The day was topped off with a cookout held outside of the town hall that gave everyone a little reward for their hard work in the form of burgers and dogs. The day showed all of Rockland that RHS athletes really take pride in their town and are grateful for the many supporters that call Rockland home. The boys lacrosse team took part in Rockland’s annual Clean Up Day on Saturday, April 28. The Clean Up was sponsored by the Town of Rockland Park Department, REiMAGINE ROCKLAND, and the Open Space Committee. Home Depot and Stop & Shop both offered corporate sponsorships. Home Depot provided supplies and staff members to assist the effort. Stop & Shop donated food for the volunteer barbecue that took place after the clean-up was completed on the Town Hall front plaza. The Rockland Lions generously donated their time to cook the food for the barbecue to thank volunteers. The Bay Colony Shakespeare Company performed Shakespeare’s Romeo and Juliet for 9th grade students at Rockland High School on Friday, April 27. The performance was funded with a grant from the Rockland Education Foundation. The BCSC’s performance used a more modern, 1970’s setting to portray the story of the star-crossed lovers. The actors stayed after the performance for a question and answer period with students, led by director, Eric Joseph. The Bay Colony Shakespeare Company is based in Marshfield, MA. and is an award winning theater company that specializes in bringing professional Shakespearean performances to local schools through its Performance in Education Program (P.I.E.). Students said they enjoyed the modern adaptation which included portraying the Nurse as closer to Juliet’s age. They also said that the actors made everything easy to follow and understand even though they used Shakespeare’s difficult language. The performance, originally scheduled in March, had been postponed because of one of the three March snowstorms that cancelled school. 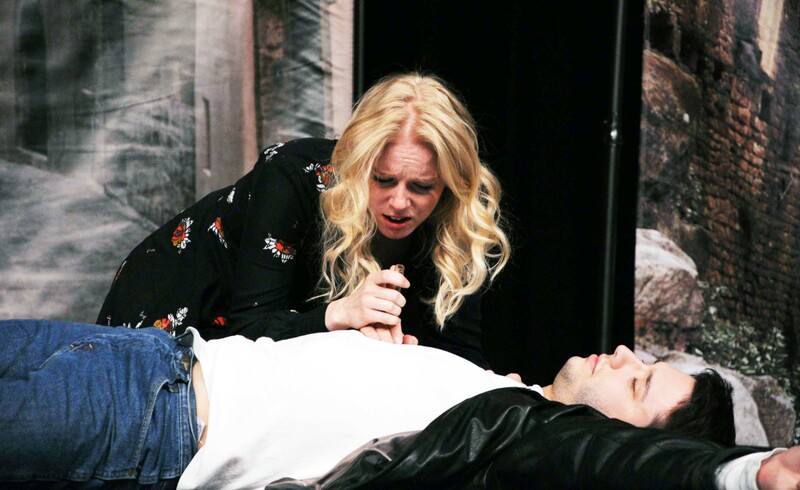 Juliet (Meghan Hornblower) and the Nurse (Rachel Tondreault). The Bay Colony Shakespeare Company’s performance of Romeo and Juliet had a more modern setting. Veritas photo. At the Capulet’s ball are from left: Juliet, played by Meghan Hornblower, the Nurse, played by Rachel Tondreault, a gentleman of Verona played by Steven Vaughan, Lady Capulet played by Liz Adams and Tybalt played by Alex Narcotta. The cast from left: Liz Adams, Alex Narcotta, David Makransky, Meghan Hornblower, Rachel Tondreault, Elizabeth Loranth, Tyler Rosati and Steven Vaughan. 2018-2019 SGC President, Caitlin Cameron (second on left) posed with her committee at the annual Christmas meeting. Every month, Rockland’s Student Government Council holds a monthly meeting. Last night during the April meeting, SGC voted in the 2018-2019 council president. After the two junior candidates, Francisco Oliveira and Caitlin Cameron gave their speeches, the council voted on who they saw best fit to lead the council. In the end, current SGC President, Hannah Murphy handed the gavel over to Caitlin Cameron. SGC members, Francisco Oliviera, Marissa Smith and a partially concealed Bieber “hater” are collecting money for the Walk for Hunger. Throughout this week, RHS is raising money for the Walk For Hunger that’ll take place May 6, 2018. 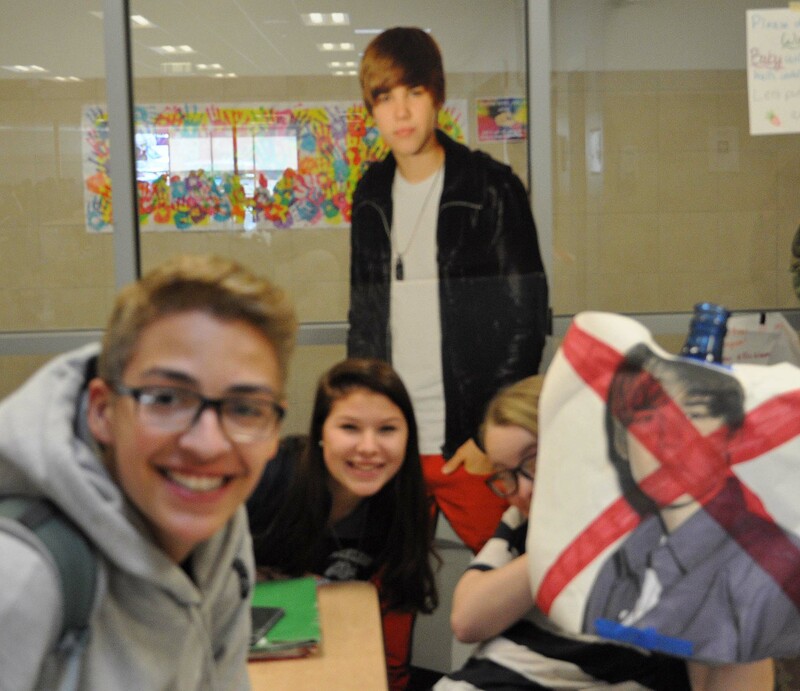 To raise money, Rockland’s Student Government Council is raising money by playing Justin Bieber’s hit, “Baby” during passing periods. Students and staff can then pay money during the three lunch periods in order to get the song shut off. SGC’s goal is to raise $100 for the 50th annual walk on the Boston Common that all students can attend. Transportation to the event will not be provided, yet the T will be free on this day. Katie McGuirk did it with her bat against W-H and P-N over vacation as the softball team came away with two big wins. Wicked local photo by Alyssa Stone. The girls varsity softball team came back twice, yesterday and today, to grab their first two victories of the season and bringing their record to 2 wins and 3 losses. On Tuesday vs. Whitman-Hanson, the girls pulled off 9-8 win after being down going into the bottom of the seventh. Coach Sharon McGonigal called it a “great team effort.” Sophomore Dakota PIke went 3 for 3 and drove in the winning run in the last inning. 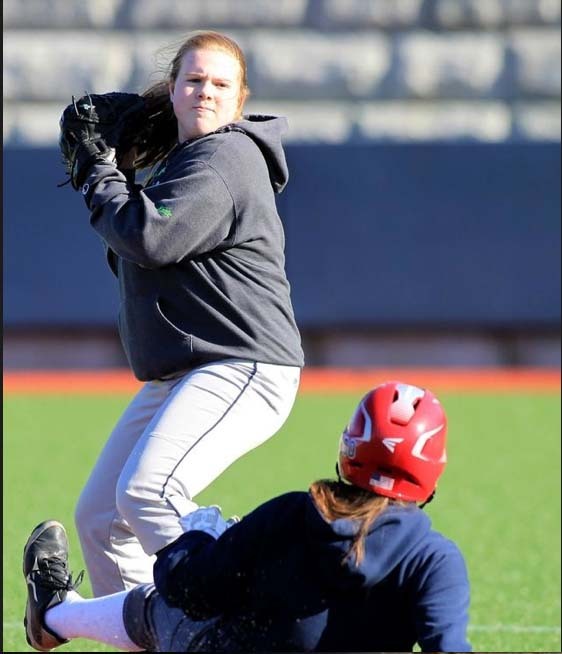 Also a sophomore, all-star second baseman, Katie McGuirk went one for three with a home run and 3 RBI’s. Freshman Macy Grass went three for five with an RBI. Today vs. Plymouth North Katie McGuirk was at it again with another home run, a two run blast this time that gave the Bulldogs the go-ahead run, 6-5. Today’s game evened their record with Plymouth-North, having lost the season opener in Plymouth, 7-4. To see our preseason preview of the young softball team, click on this link. In response to national school shootings that are occurring shockingly frequently, RHS participated in a school-wide ALICE training and drill this week in order to prepare students for a worst case scenario. ALICE training empowers students to barricade the classroom or flee, if possible, in case of a school shooter situation. On Tuesday, students were informed and shown videos of drills and procedures on how to best handle the situation. Today, students participated in two drills with a “shooter” in two different locations to make students aware of their best options, given the classroom they were in at the time, and to show students and staff what to do in the scenarios. The drills went smoothly and as expected. Students and staff were able to exit the building if the situation called for it, and properly barricaded their classroom if that were the step that was decided to be necessary. By doing so, RHS administration and staff hope to make the school a safer, and students more aware and prepared in case of an emergency. Follow this link to see the training video shown to RHS students on Tuesday. Follow this link to read Matt Dalton’s article on the topic of School Safety that appeared in the April 12 issue of the Veritas.